After a brief stint out of the lineup, Nashville captain Roman Josi was glad to be back. "Anytime you're hurt, you miss playing with the guys, being on the ice for games," Josi said. "It felt good to be back, and more importantly, we got the win." "The first five games, it was good," Colorado coach Jared Bednar said. "We were a hard-working group. We were really competitive in those first five game and I feel like it has kind of slacked off a little bit here in the last couple. We've got to find a way to rebound." MacKinnon scored the game's first goal at 4:09 of the second. With the Avalanche on a power play, MacKinnon's wrist shot from the top of the left faceoff circle deflected off of Josi's right skate in the low slot and by a helpless Rinne. "That's just the great thing about him," Forsberg said of Arvidsson, his Swedish countryman. "He passes to you and you look up and he's ahead of you and you pass it back. He's playing well." Emelin started the rush from inside Nashville's defensive zone. The secondary assist was his first point as a Predator. "To get that opportunity with the two-man is always important," Nashville coach Peter Laviolette said. "If you kill it, the momentum could swing their way. If you can cash in, you can swing it your way, so those opportunities are big." The Predators entered Tuesday with the NHL's third best power play with a 29.2% success rate. They were 1-5 with the man advantage against the Avalanche. Sissons made it 3-1 at 19:15 of the second with the teams skating four aside in a goal scored in similar fashion to Arvidsson's. Craig Smith sent a pass from the left circle to Sissons in the slot, where he slipped a backhand between Varlamov's pads. Colorado's 21 shots were a season low. Six of those shots came on the power play. 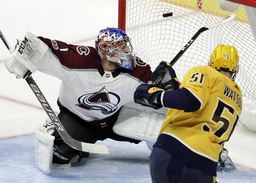 "We just weren't getting set up tonight," Avalanche captain Gabriel Landeskog said. "We just couldn't find a way to get in with control and set it up. That's a matter of just outworking the PK unit, so we've got to get better at that." NOTES: Nashville is 3-0-0 at home this season. Forsberg, who has at least one point in four consecutive games, recorded his 200th career NHL point. ... Colorado C Colin Wilson played his first-ever game against Nashville. The former 2008 first round draft pick played the first 502 games of his NHL career for the Predators. Rinne is 21-7-2 lifetime against the Avalanche.